If you need a filling side dish or dinner, this Cauliflower Mushroom Rice is it! 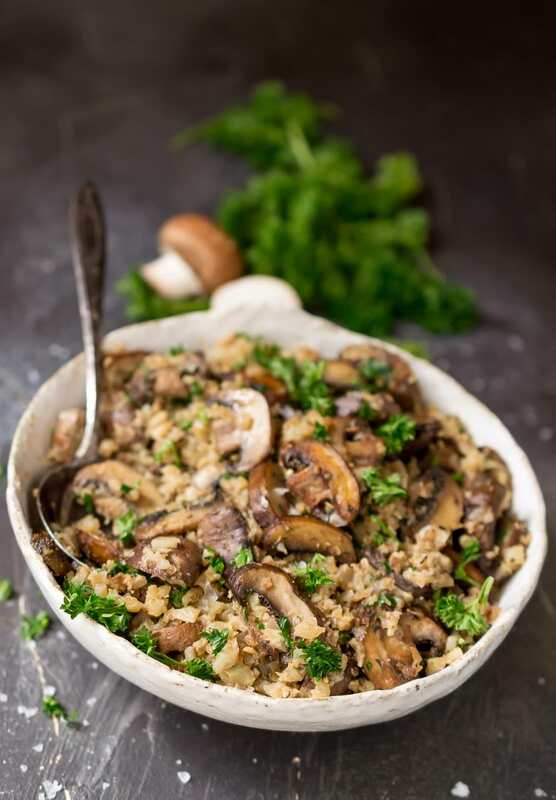 Cauli rice packed with golden brown roasted cremini mushrooms and fresh parsley. 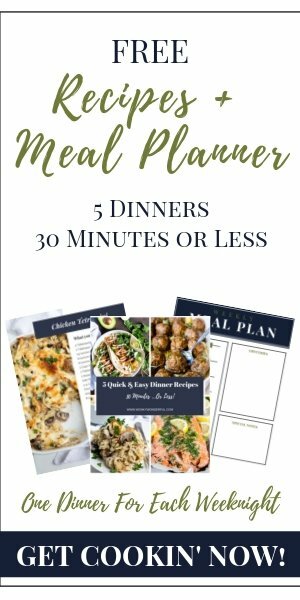 This recipe is Paleo compliant, Whole 30, Gluten Free, Grain Free, Dairy Free, Vegetarian and has Vegan options. I freaking LOVE mushrooms! In fact, much like the folks that think cilantro tastes awful, I feel sorry for people that can’t get over the fact that mushrooms are a fungus. 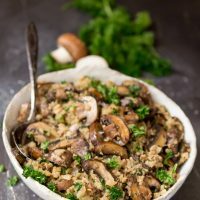 They are missing out on deliciousness like this Cauliflower Mushroom Rice! I wasn’t always a huge fan of cauliflower rice. Not until I figured out how to cook it properly. It’s all about the high heat . . . get a toast on that rice! What the heck is cauliflower rice? Good Question 😆 Cauliflower rice is raw cauliflower chopped into small pieces. It is then sautéed and served as a rice substitution. I’m not gonna say that it tastes just like rice. Buuuut, if you are avoiding grains, cauliflower rice is definitely a good alternative to rice. How do you choose the best mushrooms? I focus mostly on the texture. Firm mushrooms only! If there is any soft squishiness, do not buy. That means they are getting old. If there is a funky smell (almost fish-like) don’t buy. So basically you want firm mushrooms without any funk. Oh, and if they are slimy at all . . . no, just don’t do it. 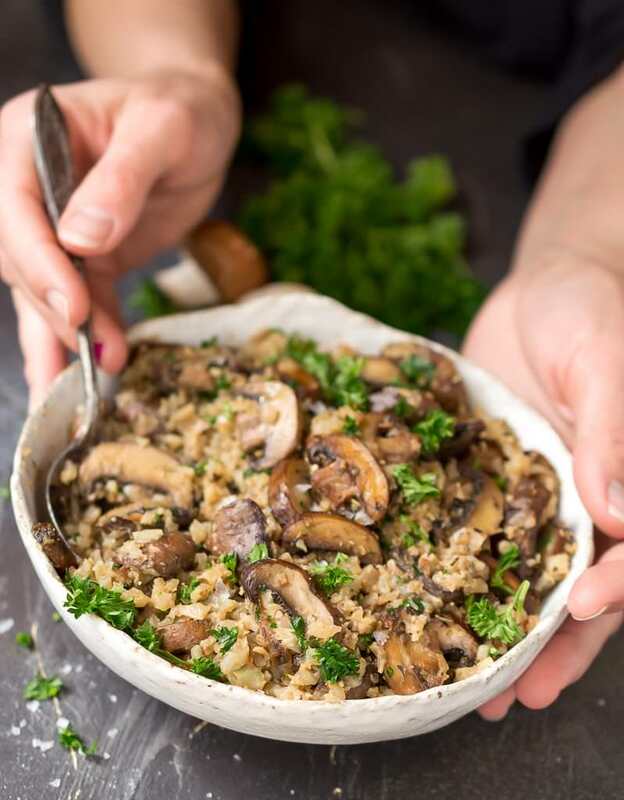 How should you serve this mushroom cauli rice? This can be a side dish with any protein or veggies. Really, this dish is filling enough to eat as a meal by itself. Or, add some chicken or beef for a complete dinner. You will need a Rimmed Baking Sheet and Good Fry Pan. These Chef’s Foundry Ceramic Knives are great for slicing, cutting and chopping! This Cauli Mushroom Rice is great for meal prep, I use these Glass Meal Prep Containers with Lids . You want the pan and oil very hot before adding the cauliflower rice. Once added, leave it for a minute or two. We want that cauli rice golden brown and toasty. Feel free to add chopped onions, peas, zucchini, spinach . . . any veggies you can think of. To make this vegan, just sub oil for the ghee. 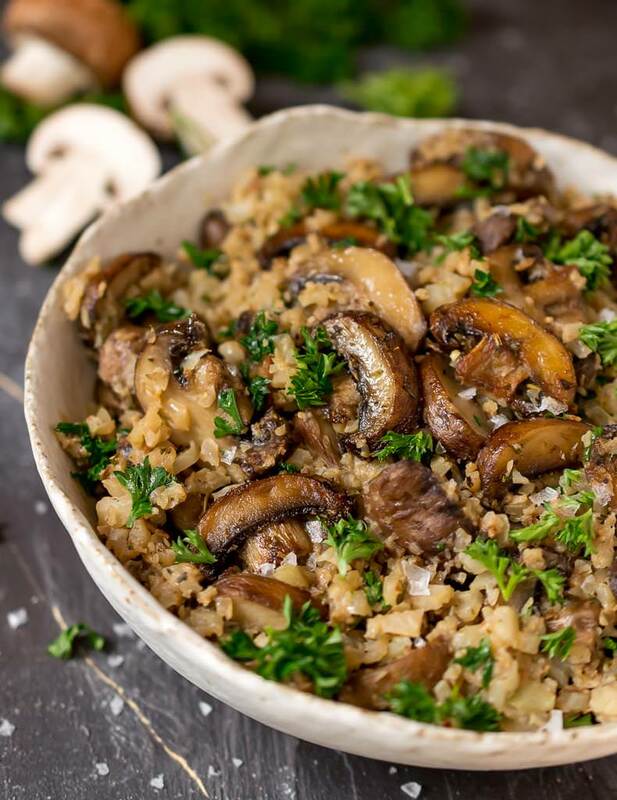 If dairy isn’t an issue, parmesan or mozzarella cheese would be great on this mushroom rice. In large bowl, toss mushrooms with garlic powder, Italian seasoning, grated garlic and melted ghee. Grease a rimmed baking sheet. Arrange sliced mushrooms in an even layer. Bake 10-15 minutes or until browned. Half way through drain off any liquid if necessary. Remove from oven, salt/pepper and set aside. Add cauliflower rice in an even layer. Cook for 4-5 minutes without stirring to brown the bottom. Stir then cook for approximately 5 more minutes or until golden brown. Add almond milk. Stir for 30 seconds to allow almond milk to absorb. Add mushrooms, parsley, salt and pepper. Stir until combined then remove from heat and serve. This post contains affiliate links. Basically, I get a little kick back for sending you over when a purchase is made . . . at no extra cost to you. Thanks for your support! What can you sub for almond milk? We have a nut allergy.